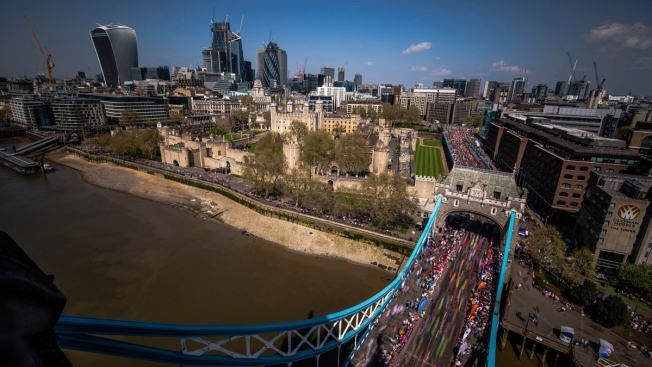 Matt Campbell last year appeared on the BBC's "Masterchef: The Professionals"
Seen from the ramparts above the roadway, runners make their way over Tower Bridge during the 2018 London Marathon, Sunday April 22, 2018. Matt Campbell collapsed after 22.5 miles and died at the hospital. He appeared last year on the BBC's "Masterchef: The Professionals." Temperatures reached 73.8 degrees near the end of the 26.2-mile course. A 29-year-old man died after collapsing near the end of Sunday's London Marathon in the hottest conditions ever seen for the event, race organizers said. Organizers said "although he received immediate medical treatment on the scene from race doctors, he died later in hospital." Campbell last year appeared on the BBC's "Masterchef: The Professionals." A medical examination is still required to discover the cause of death, organizers said.